SlurryStore – Kohlbrecher Equipment, Inc.
Slurrystore Systems are your best option for economical manure management, bioenergy applications, and environmental stewardship. Slurrystore Systems are engineered to the highest standards using glass-fused-to-steel panels which resist corrosion and have a long life cycle. 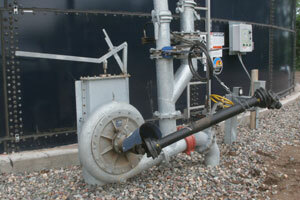 Its above-ground positive containment design conforms to USDA-NRCS regulations and can aid in odor reduction. Perhaps more importantly, a Slurrystore System will help maximize nutrient value through its built-in center agitation system. 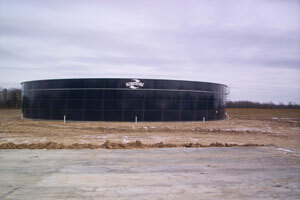 A Slurrystore System is also expandable to meet any growth needs. With continually high fertilizer costs, dairy and livestock manure is no longer a liability but an important asset. A properly sized Slurrystore can easily store manure for months before it is transferred to fields to provide valuable nutrients for crops. The Slurrystore agitation system ensures a consistent nutrient mix for the optimum value of N, P and K in each load hauled to the field. Research shows that 30 tons of dairy cow slurry, the amount produced by 1.5 mature cows consuming a balanced diet in a year’s time, can provide the total nitrogen fertilizer needs for one acre of 150 bushel-per-acre corn. Slurrystore Systems feature a variety of pumps and accessories to satisfy the needs of your ag nutrient management system.